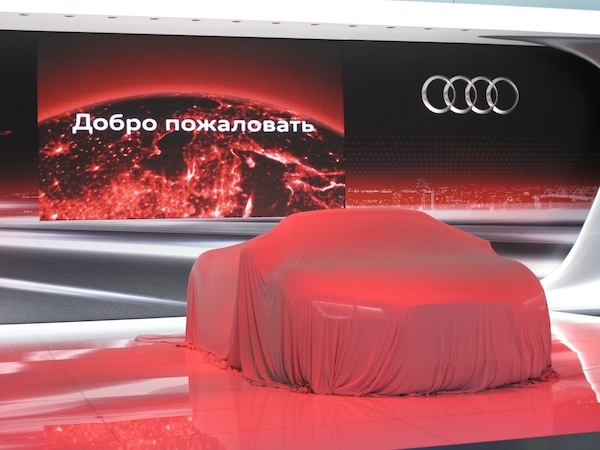 Underlining the prominence of the former Soviet market, Chairman Rupert Stadler and Audi board members were on hand in Moscow to witness the unveiling of the 2013 Audi R8. The latest version of this the firm’s halo sports car features face-lifted front and rear clips. The latest version of Audi’s pioneering LED headlights have been installed and incorporated into the rear signals also. A new V10 coupe Plus model features a 550HP V10 engine and a new S-Tronic dual clutch transmission. The application of the dual clutch gearbox is a significant upgrade over the R-Tronic single clutch auto-style box on earlier R8 models. The paddle shifted 7 speed S-Tronic replaces the R-Tronic across the R8 lineup and is now standard on the V10 R8’s. The S-Tronic features launch control for the first time. The 6 speed manual remains as the standard transmission on the V8 powered units, and the S-Tronic is optional. Audi has also infused a good dose of carbon fibre material to replace some of the metal panels on-board. The lightweight material result in a 353 pound reduction in the curb weight on the V10 models. Performance is marginally improved with sprint times to 100 km/hr (62mph) now reduced to 3.5 seconds on the V10 Plus model. The drop-top Spyder model receives the same technological upgrades but is not available with the Plus package features. 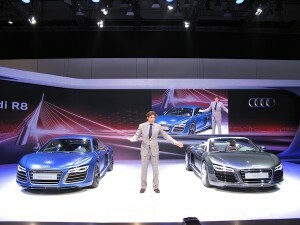 Look for the refreshed R8 to show up in showrooms later this year. prices in Canada have yet to be announced.